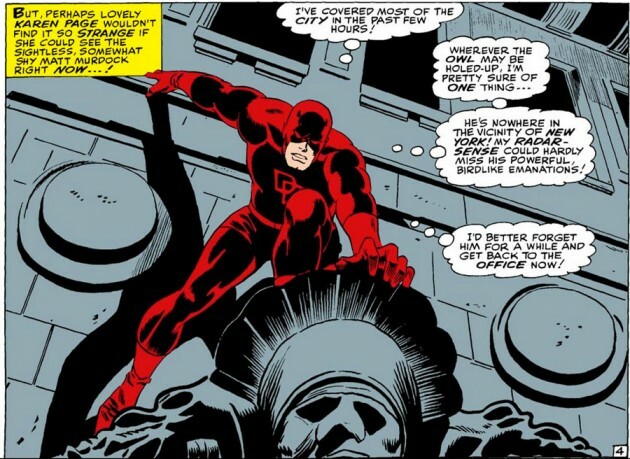 Daredevil's Wacky Power #22 – "Birdlike emanations"
Here’s a quick post to get back into the groove of things! Remember how Daredevil has shown the ability to sense a villainous aura? This is how he apparently recognized the evil behind The Owl, Purple Man and one of the many Misters Fear. And, in a recent issue of New Avengers, the aura concept was back again. There is still so much that is mysterious about the Owl… like his powerful emanations. Maybe it’s his diet. Great picture of DD. Are you sure that’s Gene Colan? Looks like JR Sr.? This is early Gene Colan (Daredevil #22 was his third issue). Maybe he was trying to imitate John Romita Sr who penciled issues #12-19? The statue underneath DD is totally Gene Colan with an unusually traditional inking job. As for birdlike emanations … what DOES DD think of pigeons, then?